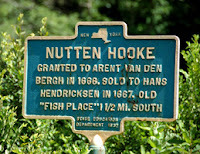 An article about the the Hudson River School Art Trail appeared yesterday in the New York Times: "Following the Artists Who Followed the Hudson." 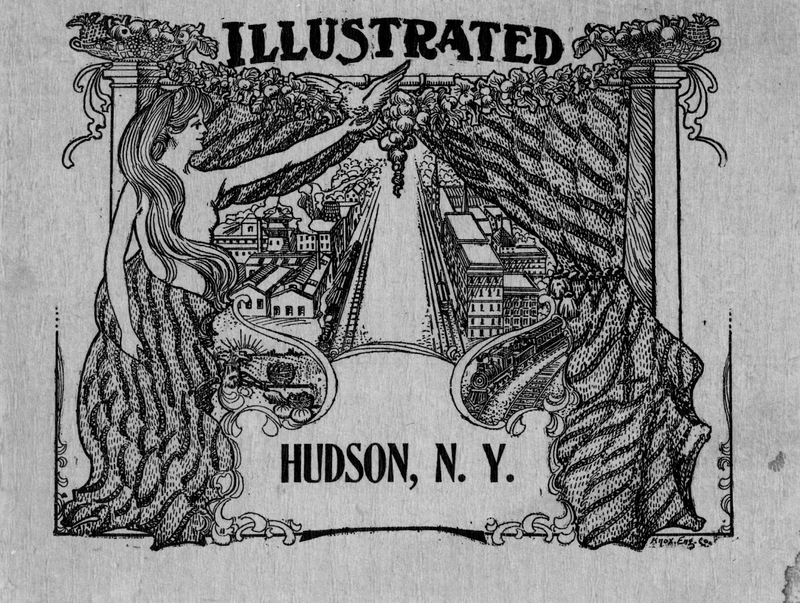 The following is an excerpt from the booklet Illustrated Hudson, N.Y., published in 1905. NEW CURTISS HOUSE--Rates $2.00 per day. Frank T. Langlois, proprietor. This is one of the popular price hotels of the city, and one that is enjoying a fine patronage. The house has been established here for many years, but its present proprietor has had it for only the past three years, yet no better demonstration of his progressive ideas could be required other than the fact that he has built the reputation of the house to a point of excellence both in service and modern improvements. The house has accommodation for a large number of guests, and in connection a fine bar is operated, whereat the best of the land can be obtained in the way of fine beverages. In the rear of the hotel is conducted a summer garden and here it is always cool and enjoyable. 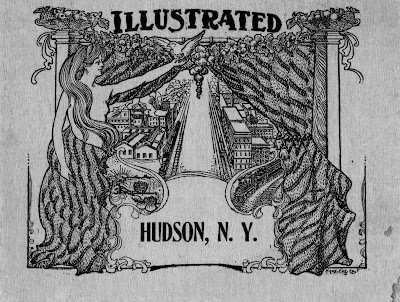 Gossips Note: Illustrated Hudson, N.Y. doesn't give an address for New Curtiss House, so I headed over to the History Room at the Hudson Area Library to check the 1905 city directory. There I discovered this address for Curtiss House: "S Front cor Allen." The problem is that the same address--"S Front cor Allen"--was given for another hotel: City Hotel. Which hotel was on which corner? 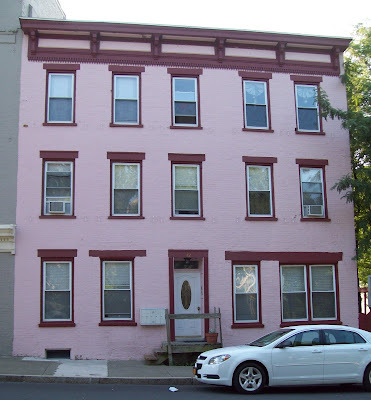 To answer this, I sought the help of city historian Pat Fenoff, who told me that 52 South Front Street--the south corner--had been City Hotel, but Curtiss House had not been located on the opposite corner. 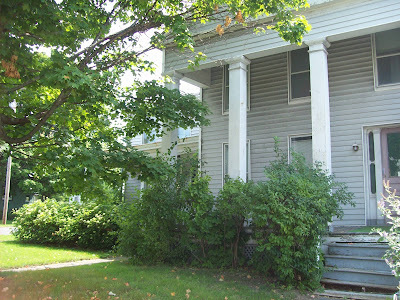 From 1877 to 1883, the address for Curtiss House is listed as 42 South Front Street. Fenoff told me too that the 1871 map of Hudson shows the north corner of South Front and Allen streets as a vacant lot. There's a problem, though, with accepting 42 South Front Street as the location of New Curtiss House. In 1905, according to the Hudson directory, 42 South Front Street was the address of the Franklin Square Hotel. So the question remains: Where was New Curtiss House? The second full moon in August--a Blue Moon--happens tonight. The Department of Transportation held a meeting last night to hear public input on its seven alternative ways to deal with the Ferry Road crossing over the railroad tracks in Stuyvesant. Barbara Reina has the story in today's Register-Star: "DOT gets input on crossing's future." A public meeting has been scheduled for Wednesday, September 5, to discuss problems and issues related to rental units in Hudson and the possibility of enacting a housing inspection law. Tom Casey has the story in today's Register-Star: "Meeting will focus on city housing." The meeting, which brings together landlords, tenants, and representatives of the police and fire departments, was organized by Alderman John Friedman (Third Ward), chair of the Common Council Legal Committee. It begins at 6 p.m. at City Hall. 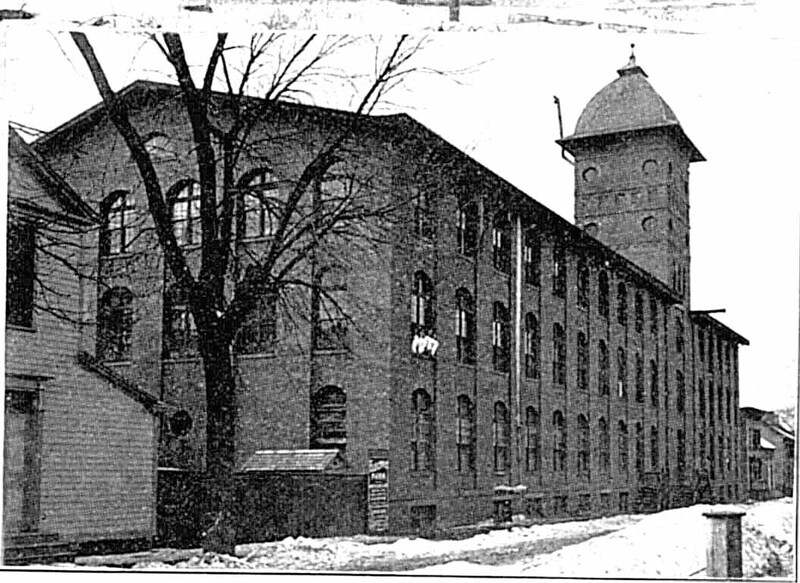 In 2010, Gossips did a post about this building, the identity of which had puzzled me but which longtime Hudsonians knew to be the Knauss Brothers mushroom factory, later Candy Lane, where giant spiral lollipops and all manner of candy was manufactured. 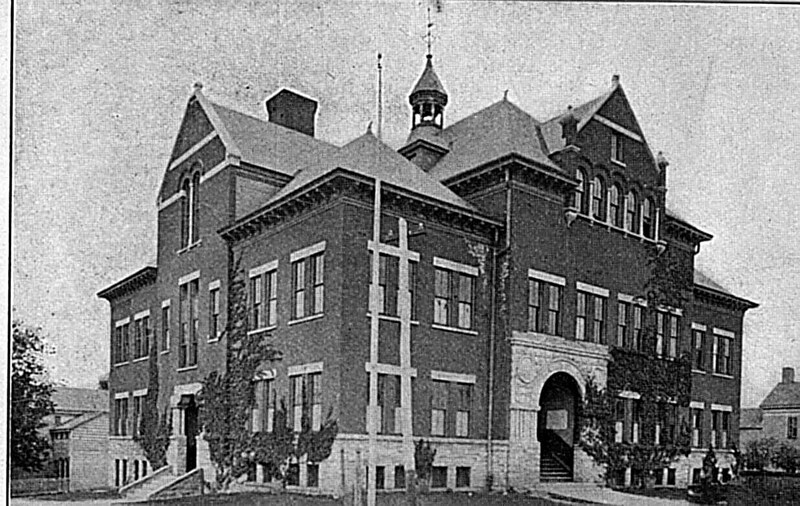 The building, located on the southwest corner of Columbia and Second streets, where Providence Hall now stands, burned in a spectacular fire in 1979. At the time, it was abandoned, and the story is that the fire was started by kids playing with matches on the loading dock. Yesterday John Cody shared these pictures he had taken of the fire and gave permission for them to be published on The Gossips of Rivertown. Sam Pratt continues to pursue the question of what was being stored in the TCI building when it went up in flames on August 1: "TCI: What's the story on what they stored?" DOWNING & BOGARDUS--Wholesale and Retail Dealers in Hay, Straw, Grain, Flour, Feed, Salt, Plaster, Etc. Franklin Square. (At the river.) Identified with the business life of Hudson for the past eleven years has been the firm of Messrs. Downing & Bogardus, the members of which are D. B. Downing and A. F. Bogardus. The business, which is the largest of its kind in the city, is in a position to handle orders of any quantity. Receiving in carload and shipload lots from the mills and producers, they are therefore able to save their customers time and money. A large stock is carried at all times, and their five-story building has ample storage capacity to hold and facilitate the rapid handling of goods. Messrs. Downing and Bogardus are business men who believe in building up a patronage that will stand by them, and are therefore able to quote prices to their customers wherein it is of advantage to them to trade here. The Prison Public Memory Project, which describes itself as "focused on making prison history relevant as a guide to the future," today launched a website and blog. 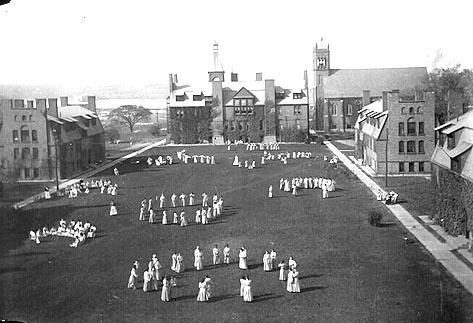 The Project's initial focus of attention is our own Hudson Correctional Facility, which started out in 1887 as the Women's House of Refuge, became the New York State Training School for Girls in 1904, where in the 1930s Ella Fitzgerald was sent to be reformed, and in 1976 was transformed into what it is today: a medium-secure prison for men. The website makes fascinating browsing. To quote the press release: "Visitors to the website can view current photos of former prison workers and inmates and listen to audio clips from their oral histories; see old photographs and maps of the prison; and read prison documents and letters from the 19th and 20th centuries. Short articles tell about ordinary as well as extraordinary prison-related events and people that influenced local, state, and national history." 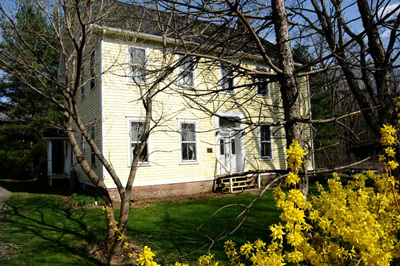 There's an interview with Timothy Dunleavy, president of Historic Hudson, who talks about the Dr. Oliver Bronson House and how it was used during the Girls' Training School era (1904-1975). A section of the website invites visitors to help the Project team answer questions and locate evidence. 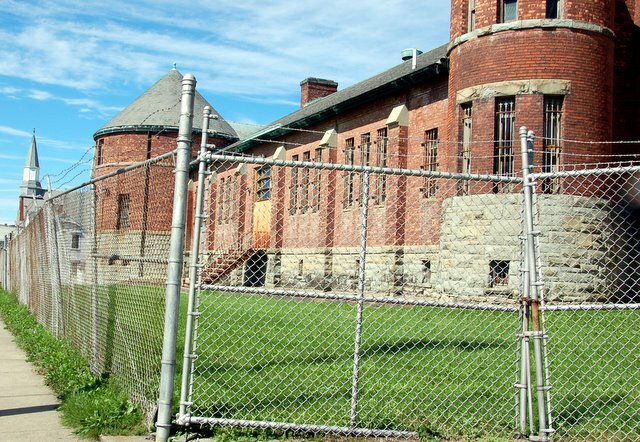 Project founder/director Alison Cornyn says of the Project: "Prisons, especially old prisons like the one in Hudson, have touched thousands of lives over the course of their history, in both profound and ordinary ways. Using history, art, dialogue, and new communications technologies, the Project will craft safe spaces and new opportunities for people from all walks of life--including those who lived and worked inside the walls--to connect with the past and each other and engage in conversation, learning, and visioning regarding the role of prisons in communities and in society today and in the future." 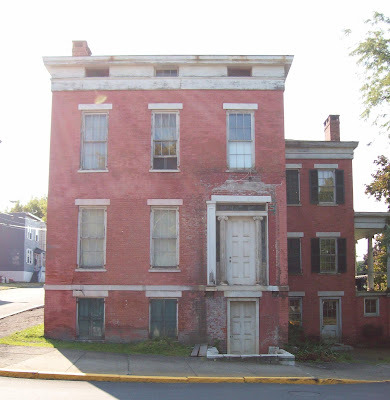 Here's some news from Newburgh, where the challenges are greater but the response from city government has always, in my opinion, been light-years ahead of Hudson's when it comes to historic preservation: "Good news breaks out in Newburgh." 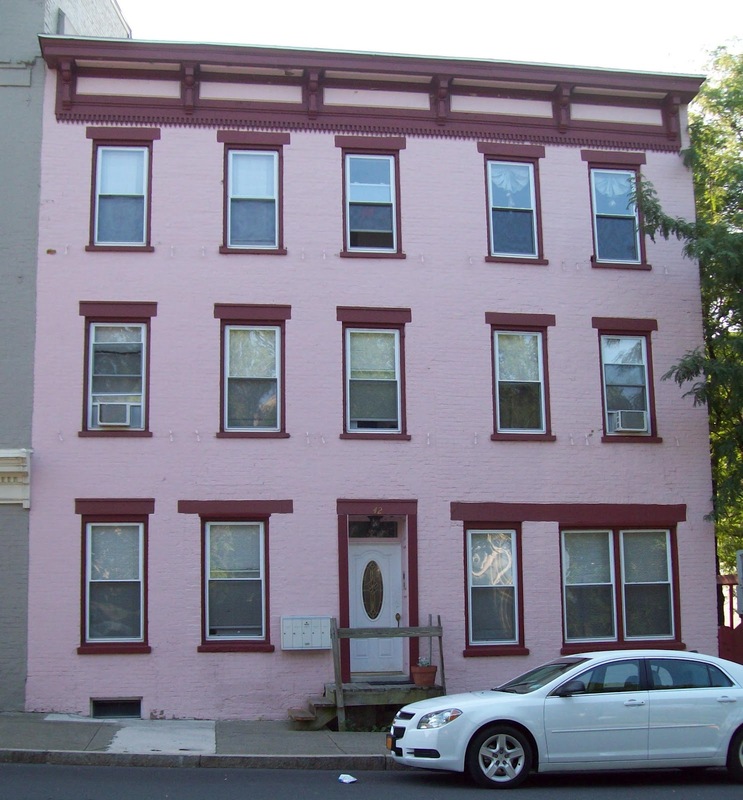 It's about the Newburgh Community Land Bank--a plan and a promise from Newburgh mayor Judy Kennedy to rescue vacant buildings, stabilize them, and sell them to people who want to live in them. 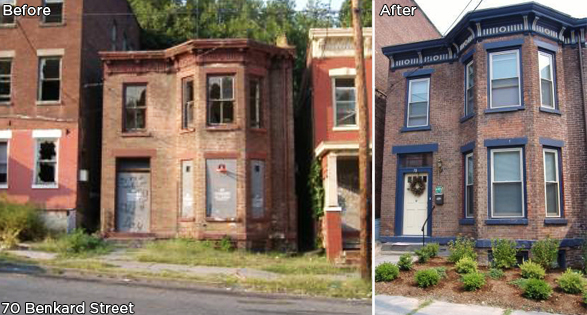 I borrowed the photograph that accompanies this post from the National Trust for Historic Preservation website. 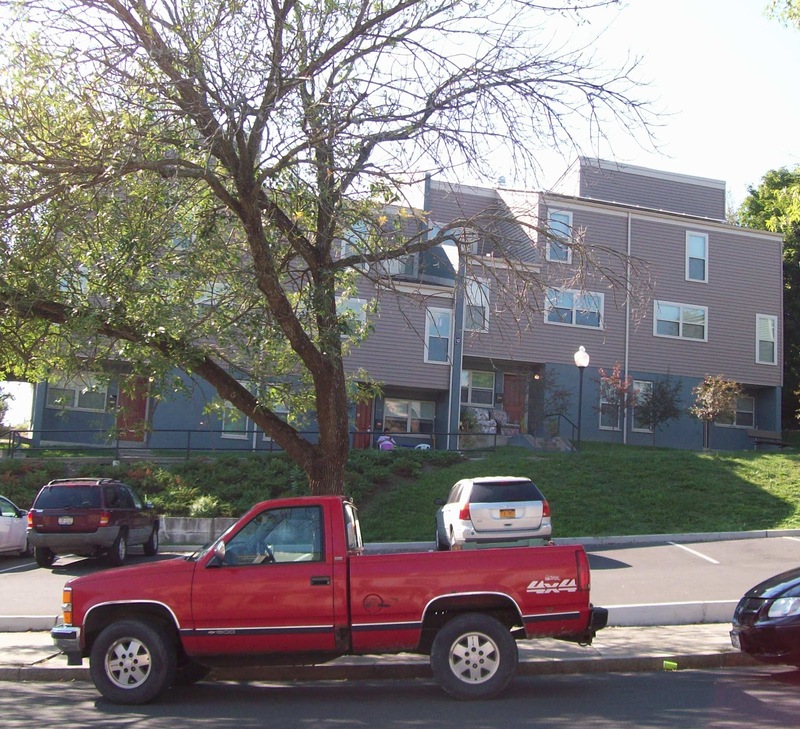 You may want to check it out to see what Habitat for Humanity is doing in Newburgh. A month ago, Gossips published the account of a brawl between Whigs and Democratics that took place in 1840 on the steamship South America. 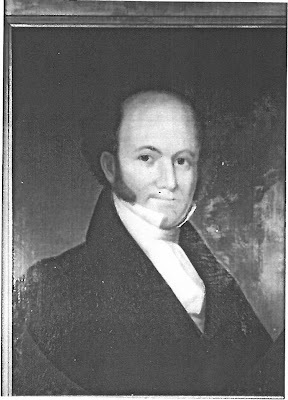 The brawl was incited by a portrait of Martin Van Buren, painted by Henry Ary, which hung in the steamer's main saloon. The portrait, after being cut and kicked and nearly burned in the melee and later used for some years as a fire board in someone's front parlor in Brooklyn, ended up being given to the Long Island Historical Society, now the Brooklyn Historical Society. At the time I published the account, I made an inquiry about the portrait, and today I received a reply from Elizabeth Call, Special Collections Librarian at the Brooklyn Historical Society. She told me they did have a portrait of Martin Van Buren, but it had been deaccessioned in 1987, and she could not confirm that it had been painted by Henry Ary. She provided the information that the receipt of "a portrait in oil of President Martin Van Buren, painted while he was Attorney General of the State, between the years 1815 and 1819, and presented by the Hon. John G. Schumaker, of this city" is recorded in the society's annual report for 1867. Schumaker, of course, is the person who wrote the account, in which he indicates that it was he who rescued the portrait from its ignominious function in the parlor and gave it to the Long Island Historical Society. Elizabeth Call also sent a copy of a photograph of the portrait from the society's files. John Hutchinson, the owner of this historic house on Ferry Road in Stuyvesant, has a letter to the editor in today's Register-Star: "Ferry Road." 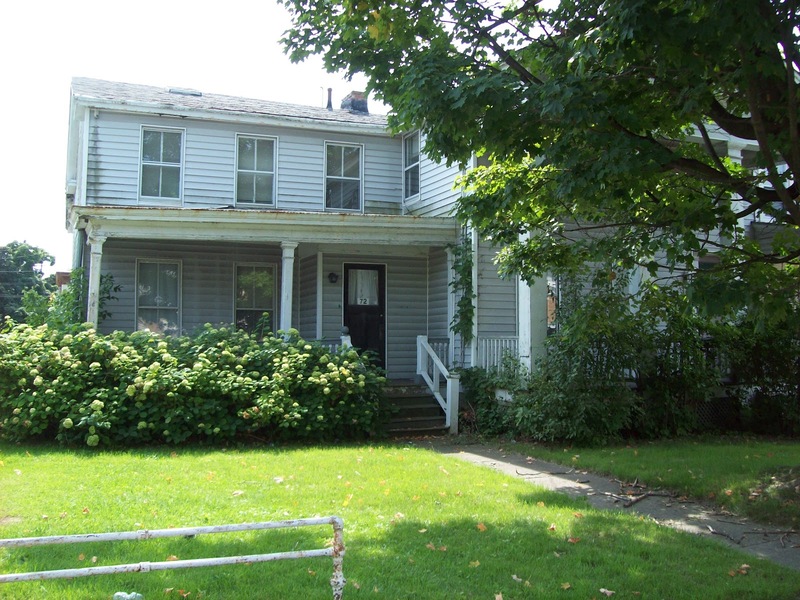 Hutchinson's house is one of the historic houses that would be seized by eminent domain and demolished if the Department of Transportation were to follow its Alternative 7 and close Ferry Road. There is a meeting tomorrow night at 6 p.m. at Stuyvesant Town Hall at which DOT will gather public input on the issue. For the past few days, the Gillette Mansion, the Italian villa also known as the old Elks Club, has been used to film a movie for German television. Tom Casey has the story in today's Register-Star: "Old Elks Lodge becomes movie set." FRANK L. HORTH--Grocery and Bakery, 19 South Front street. No business in this city is better known to the people of Hudson than the establishment of Frank L Horth, who has been in business here for twenty-one years, and in all that time he has always made it a rule to only handle those goods that were of the best and which met with popular approval. His bakery is well equipped ion every way, and cleanliness is one of this strong features, and this motto is carried out in every department. His bread, cakes, and pies are well known for their appetizing qualities, and in this respect he has no equal in town. Six men are employed, and delivery wagons cover the entire city. 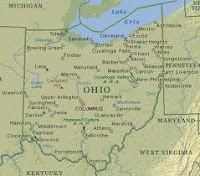 I just heard Ohio governor John Kasich at the Republican National Convention boasting about how his state was first in the Midwest and fourth in the nation in jobs creation. He railed against regulations that stymied new business. Hmm. Didn't I hear that in Ohio they are injecting waste water from hydrofracking into dry wells? It recently came to Gossips' attention that the Galloway Gallery was missing a few exhibits. The most recent acquisition--213 Union Street--had been added to the gallery, but there were a few others that had escaped Gossips' notice. A little time spent with the eight pages in the tax rolls taken up by properties owned by Eric Galloway and Galvan Partners uncovered what had been missed. 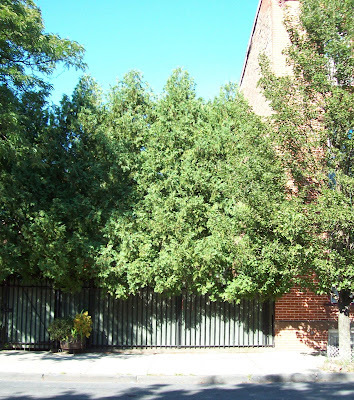 So today, we resume the Galloway Gallery with two houses on North Fifth Street: 70 and 72. 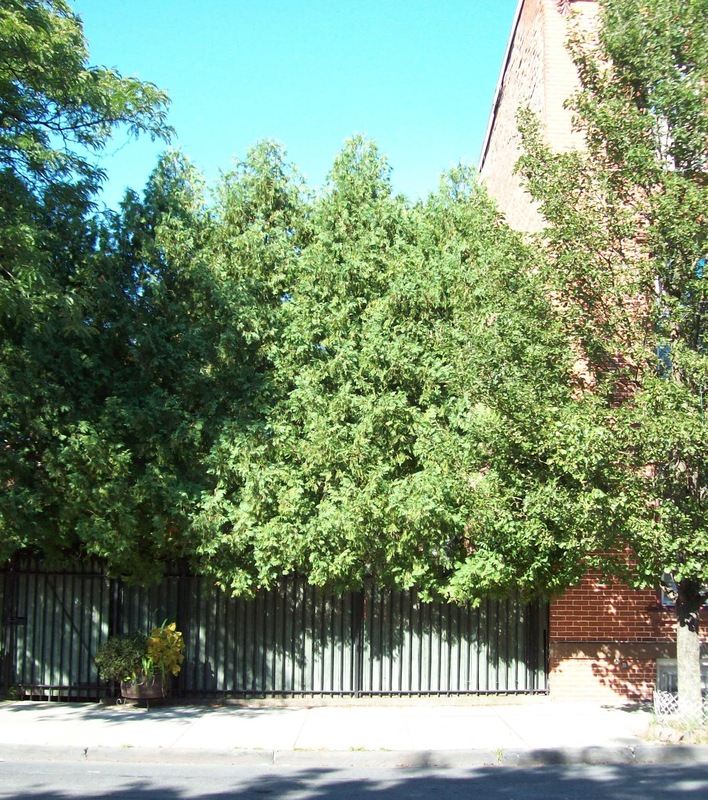 The two houses, which are attached, are directly across the street from the much discussed 67-71 North Fifth Street--the larger of the two Armory houses. Galvan Partners acquired the two houses in October 2011. 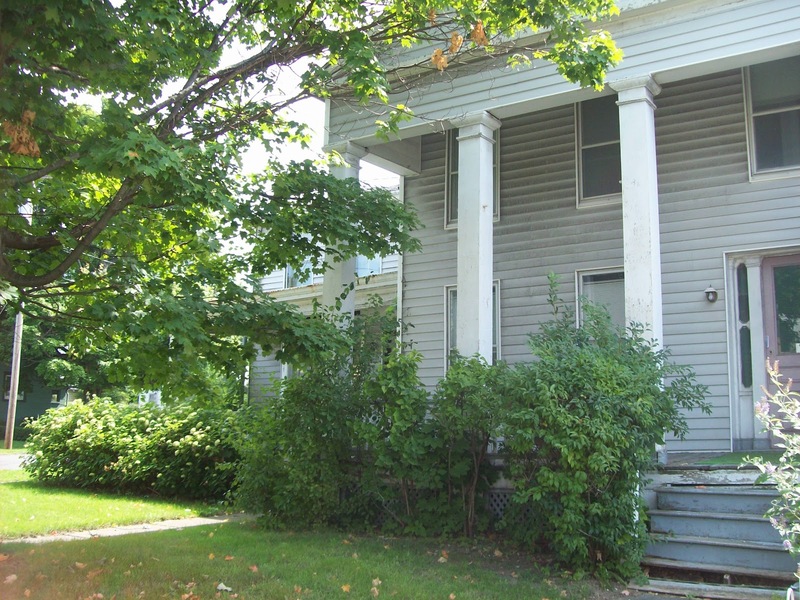 Since they already have columns and Greek Revival door surrounds, one hopes they can be restored exactly as they are. Two articles of interest about TCI and its operation in Ghent have appeared recently. Yesterday, on his blog, Sam Pratt reported on the company's relocation to our area: "A tale of two fire companies." Today, John Mason reports on the state of things at TCI before the fire: "Inspection standards for TCI unclear." JAMES C. ARMSTRONG, JR.--Plumber. No. 120 Warren street. Mr. Armstrong is at the present time located at No. 21 Warren street, but will move in September to the address given at the beginning of this sketch, where his plumbing establishment will be most complete in every particular, and at which time he will be prepared to carry on an advanced and up-to-date line of trade. Mr. Armstrong is a plumber of exceptional skill. An essential point is made in carrying at all times a fine line of goods, which are sold at the fairest prices. 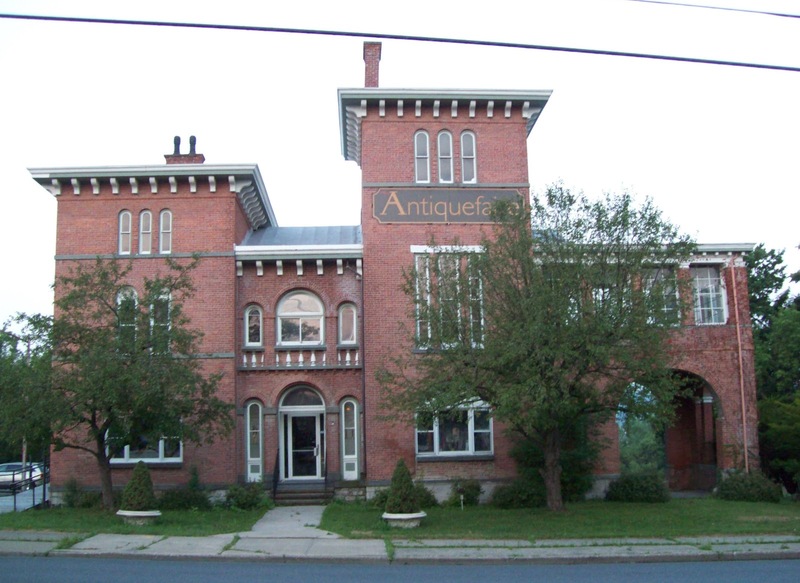 Some of the most important sanitary plumbing of the city has been executed under contract by Mr. Armstrong, and a specialty is made of gas fitting, steam and hot water heating. Estimates are made from plans and specifications. 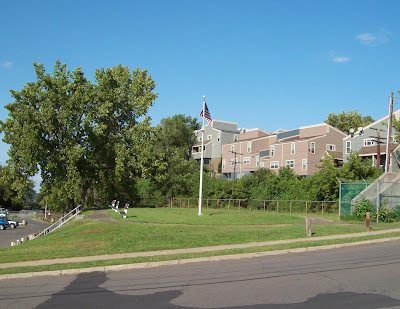 Scenic Hudson and the Town of Stuyvesant agree that the DOT should not close Ferry Road (the "No Action Alternative"). There have been no collisions between trains and other vehicles at this intersection. In addition, the other options are costly (up to $30 million) and would impose unnecessary impacts to wetlands, floodplains, and historic and archaeological resources, and also require the taking of private property. If the DOT concludes that steps must be taken at the intersection, Scenic Hudson recommends Alternative 2--installation of a traffic signal. This relatively low-cost ($333,000) option would maintain river access at Ferry Road and have no environmental, historic, or archaeological impact. The Department of Transportation will be seeking public input on the seven alternatives on Thursday night at 6 p.m. at Stuyvesant Town Hall. The Columbia County Environmental Management Council meets tonight at 7 p.m. at 401 State Street. The main topic on the agenda is expected to be the TCI fire. Michael O'Hara is the City of Hudson's representative on this council. A. McKINISTRY & SON--Drugs, Medicines, etc. No. 609 Warren street. H.R. Phone 81-F, Columbia 81. A McKinistry & Son are the successors to the old firm of Rossman & McKinistry, that was established in 1844. They are wholesale and retail dealers in drugs, medicines, paints, oils, and dye-stuffs. A large and extensive trade has always been accorded to the drug store, and the business reputation enjoyed by its proprietors is the highest. 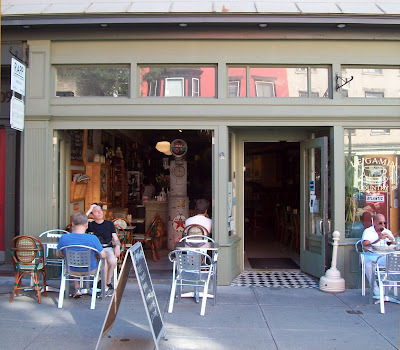 An excellent line of goods is carried at all times, including toilet articles, soaps, cigars and tobacco, etc. The wholesale trade of the house extends over a large section of the surrounding country. The firm are proprietors of Rossman's Celebrated Pile Cure, Houseman's German Cough Drops, Hardy's Elixir, French Pastilles, Magic Fluid for the Hair. Agents for Harrison Bros. & Co's Paints, Benj. Moore & Co.'s Paints, Eastman Kodaks, Rochester Optical Co., Liquozone Co., etc. Special attention paid to the prescription department. 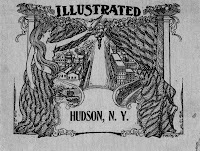 Recently a reader shared with me his discovery of a booklet entitled Illustrated Hudson, N.Y., compiled by the Industrial Advertising Company of America, located in Kinderhook, and published in 1905. It's a promotional piece--an early 20th-century effort in what we now call economic development--lavishly illustrated with photographs and providing a glowing overview of the city and individual descriptions of all the businesses that existed here in 1905. 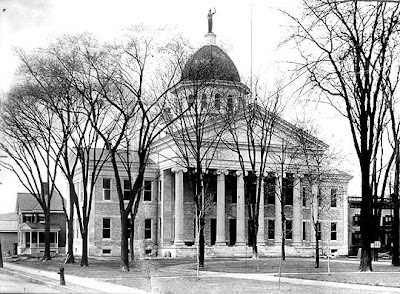 It's a treasure trove of information about Hudson a century ago. 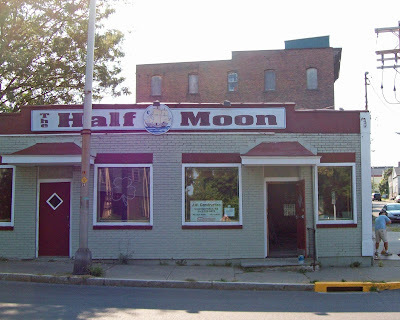 Over the next several days, Gossips will serialize the text and illustrations from Illustrated Hudson, N.Y., publishing each day the description of a business, accompanied by a period photograph, if one is included, and photograph taken today of the business's location. Many thanks to Harold and Dolly for all their help and cooperation in making this possible. We begin with the overview of Hudson, attributed to Roland Bunten. A General Illustrated Review of the City of Today. 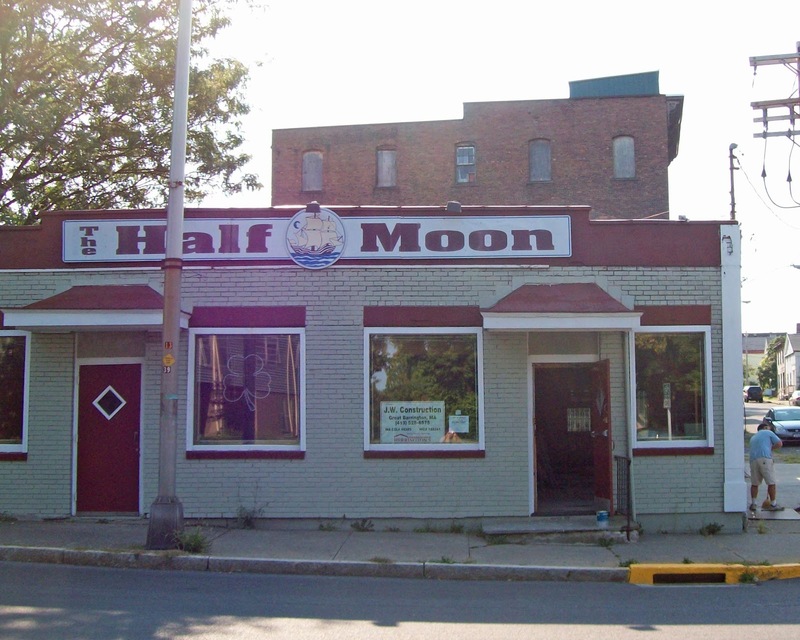 For the last half century the city of Hudson has gradually regained much of its old time splendor and prosperity. Like a great many of the very old cities of the country, it has experienced its rise and its decline; but unlike the majority of such municipalities, it has passed through the period of decadence with no great or lasting harm to itself and is once again assuming that position among the other cities of the State which bespeaks much for the highest future success. 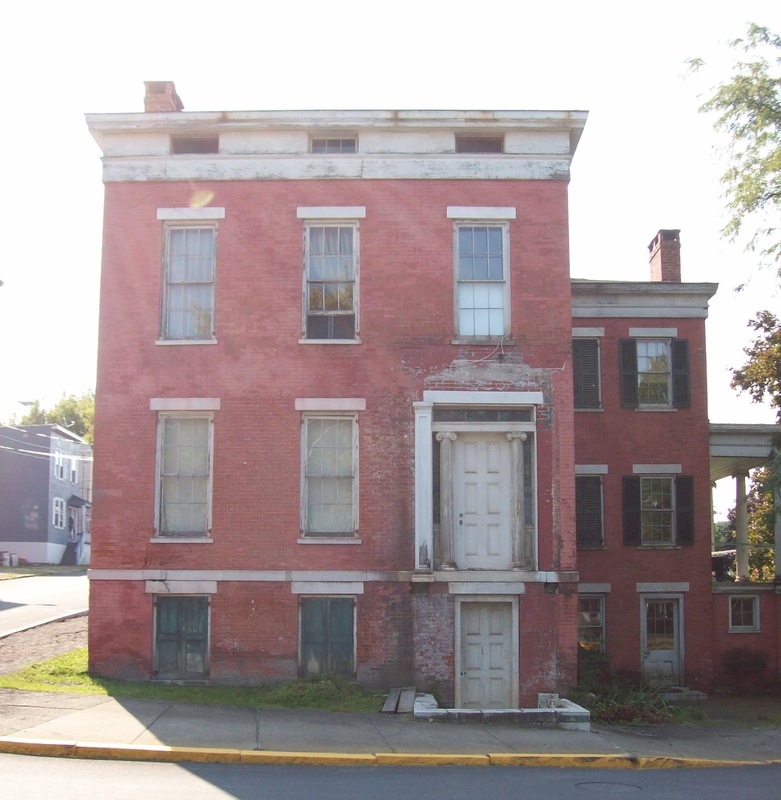 Hudson is the third oldest city in the State of New York, having been chartered and incorporated in 1785. The site upon which it now stands was chosen by those sturdy whale fishermen from Rhode Island and Nantucket, the first proprietors of the township, because of its trade facilities and the healthfulness and picturesqueness of the locality. That these men made no mistake in their selection cannot be doubted. Although other cities have sprung into existence not many miles distant since that early time, places that command greater trade conveniences and are nearer to the business centres of the world, the ancient city of Hudson still stands preeminent among the towns along the Hudson River for its invigorating air and the splendor of its scenic surroundings. It is not to the point, however, in the present work to say a great deal concerning the past history of the city; how the inhabitants prospered for more than a generation, under the superior leadership of those staunch first settlers, with such men as Thomas Jenkins and Cotton Gelston among them; how the business decline began early in the nineteenth century and continued until almost the year 1859; how the city has since risen, Phoenix-like, out of the ashes and ruins of its former self into a healthy, active and flourishing town, where mercantile pursuits and business enterprises are once more recognized and respected, and the population steadily increases year by year. Hudson was never "dead and finished"--as some of its oldest inhabitants have been led to believe. The city was merely dozing because the citizens had become sluggish and inactive in their regard for its highest welfare. What was needed during those years of municipal laziness, and what has since been applied, to the great benefit of the community, was an awakening, a spurring, to goad the city on to its earlier life and activity. Today Hudson is a city worthy of the name. But the past is dead. 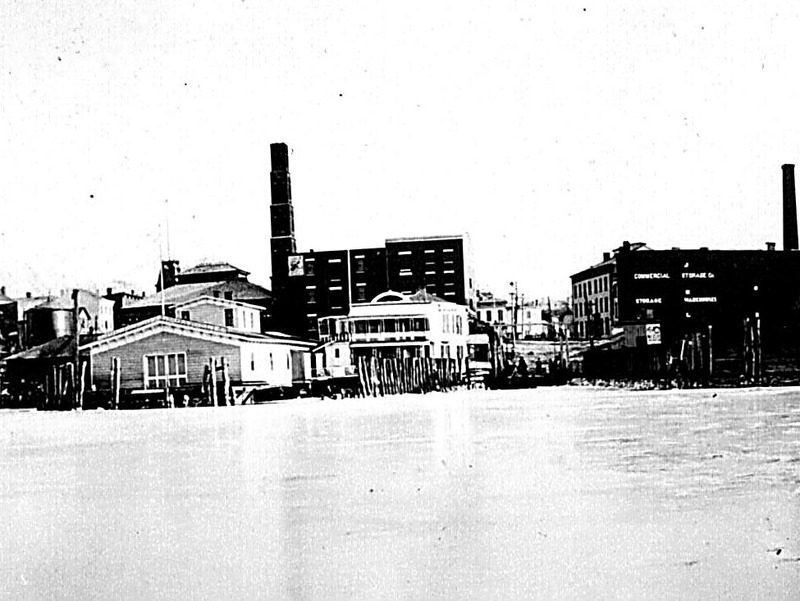 Our business is with the present; with those who are now citizens of Hudson; with living men, their ways of living, activities, daily occupations, and what they are doing for the further advancement and prosperity of their native town. 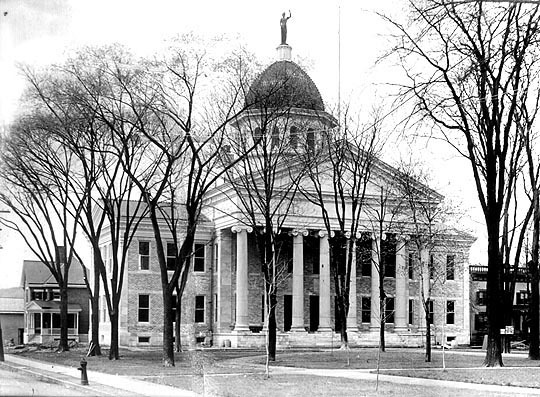 Hudson, the county seat of Columbia county, is situated upon the banks of the noble river whose name it bears. It is one of the finest cities along these splendid shores, and is unsurpassed for the beauty of the scenery surrounding it. The magnificent Hudson River flows past in all its grandeur, while across its charming waters rise the beautiful Catskills in their radiant glory and majesty, an inspiring sight to the traveler and seeker of pleasure and indicative of joy and health. The city is most favorably situated, being a railroad centre on the main line of the New York Central, connected by ferry with the West Shore Railroad and reached in summer by the day line steamers from New York City and Albany. The elevated position of the town is a marvelous benefit in itself. It rises almost fifteen hundred feet above the level of the sea, and the entire country is sufficiently rolling to afford a natural and excellent drainage. The climate is delightful during every season of the year, and especially cool and refreshing in the summer. By means of a system of city pumps there is provided an abundance of spring water which conduces to the healthfulness of the place and produces that ruddy and jolly complexion met with constantly among the people. The population of the city has varied at times, but very rarely. Although it has stood stock still for long periods at a stretch, yet the census reports from decade to decade show a gradual but steady increase in the number of inhabitants. According to the latest census the figure is given at twelve thousand. The manufacturing interests and commercial welfare of Hudson have changed from time to time, and the occupations that once possessed the thoughts of the old proprietors of the settlement have now given place to modern methods of making money. Whenever the business prosperity of Hudson has been retarded, it was always due to public calamities or the forming of new towns with her citizens. There are located here at the present time thirty-seven incorporated companies, besides numerous other business establishments. The wholesale and retail trades are excellently taken care of by merchants who are perfectly capable; there being a large number of stores representing almost every line and branch of business. For a city of its size Hudson is especially fortunate in possessing four well capitalized banking institutions, the combined capital of the four aggregating a sum that exceeds $600,000.00. Such a standing, above all things else, indicates the increased prosperity of the community and is an assurance of the best financial backing for inducing new enterprises to establish here and for opening up more home industries. Besides the banks, the real estate and insurance offices are plentiful, there being fourteen in all. The leading life and fire insurance companies of America are represented and, owing to the abundance of available property in and about Hudson, a large real estate business is annually transacted. 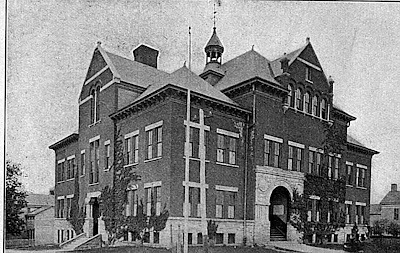 Educational advantages are by no means neglected in Hudson. Free education was begun in the year 1816 and has been supported ever since at the public expense. At the present time the city government affords one of the finest systems of free schools to be found in the Empire State, a system whose usefulness was recognized as early as 1841. The only private schools conducted here are the Hudson Academy and the Saint Mary's School. The first families that took up their abode in the old colony were of the Quaker persuasion, and they flourished until the downfall of their religious society some fifty or more years later. Now the city can boast of thirteen churches, representing all the most important religious denominations, the Presbyterians being in the lead as the next oldest sect to the Quakers. Special mention should be made and the highest praises should be showered upon the Hudson Fire Department. This is a thoroughly volunteer organization, consisting of six superb hose companies, every one of which is made up of men who have their hearts set upon the duties they may at any time be called upon to perform, and men who will fight to the bitter end to protect the city's property. Great service has been rendered to the city at large by these companies in the past, and the citizens are enormously proud of the department and show their gratitude by means of substantial gifts and donations. The hose houses occupied by the firemen have been reared at the instigation of various benefactors to the city and have been named after them. Benefits are attached to membership in the department, and the organization is in every respect regulated to the highest pitch of perfection. The above facts will, it is hoped, convince all seekers of homes and men who are expecting to establish business enterprises that they can do no better than select for their purposes such a city as Hudson. There was a time when capital, wealth and people were turned away from Hudson by the false report and mysterious feeling that the place was "dead." On the contrary, it has been proved to be very much alive and energetic. The latest and most trustworthy historian of the town has the following summary to make: "We claim for Hudson, and especially from those who have gone from among us, the credit due it for just what it is, a healthy, pleasant, improved, living and growing place, neither dead, deserted, half-populated nor in the midst of melancholy surroundings." On Thursday, apparently at the mayor's behest, Tom Casey saw fit to report about a stormy moment that took place during an executive session at the Common Council meeting on Tuesday night: "Remarks trigger council's concern." Yesterday a reader brought to my attention the account, in Ellis' 1878 History of Columbia County, of the end of the Proprietors' association. Although it wasn't the reader's intention, the first paragraph of the account reminded me that there has always been a certain amount of volatility involved in the business of governing Hudson. Thomas Jenkins, the most prominent man among the proprietors of Hudson, died in the 1808. . . . The organization of the proprietors continued less than two years after his death, their last meeting being held May 23, 1810, of which Stephen Paddock was moderator, and Erastus Pratt clerk. They had some years before deeded all the streets, highways, and lands intended for public use to the common council, to be by them opened when, and as, the public interest might require, and it was now arranged and understood that their existence as an association should cease, and that their records should be formally delivered to the city. This action was most energetically, fiercely, opposed by Cotton Gelston, although it was into his own hands, as city clerk, that the documents were to be surrendered. In his antagonism to the proposition he seized the books and declared his resolve to destroy them if he could not otherwise prevent their transfer, and so heated did he become, that it was necessary to assign to three of the strongest men in the room (of whom Gilbert Jenkins was one) the task of his subjugation; but in the scuffle which ensued Mr. Gelston succeeded in partially destroying the papers by fire, and thus almost made good his threat. But the surrender was made, and the proprietors' organization became a thing of the past. Whatever went on at City Hall last Tuesday, behind closed doors in executive session, seems pretty tame by comparison. Gossips doesn't usually stray beyond the two square miles of Hudson, but an ongoing situation in Stuyvesant, involving two favorite issues: historic preservation and river access, merits attention. Channel 6, Channel 10, and Channel 13 have all covered the story. The "No Build" alternative will not provide any improvement to the existing conditions and will not improve safety. Traffic signal interconnected with the crossing gates at intersection of Route 9J and Ferry Road. Minor realignment of Route 9J to increase storage between the intersection and the crossing. Major realignment of Route 9J to increase storage between the intersection and the crossing and eliminate nonstandard horizontal curves. A grade separation carrying Ferry Road over the railroad. Closure of Ferry Road crossing and construction of a connector road between Ferry Road and Ice House Road. Closure of Ferry Road and acquisition of the properties west of the tracks. More information about the situation and the threat to the historic buildings on Ferry Road is available at saveferryroad.com. This morning, Ward Hamilton presented, on behalf of the Galvan Partners, the third design for 67-71 North Fifth Street in a workshop meeting with the Historic Preservation Commission. Representing the HPC at the workshop were architect member Jack Alvarez, vice chair Rick Rector, and HPC counsel Cheryl Roberts. the change in the proportion and the configuration of the windows: the second story windows in the proposed design are larger than the original windows, and all the windows are six over six, which, in Rector's words, "has no historic bearing on the house," instead of the single pane sash seen in this vintage photograph. Of the new design, Hamilton said it was "no small thing to get here" and asked the HPC to "consider how far we've come from the last design." Tom Swope, executive director of the Galvan Initiatives Foundation, who arrived midway through the workshop meeting, reminded the HPC that "the option always was to tear the buildings down." During the workshop, it was revealed that the HPC had requested a visit to the house, primarily to confirm that the roof framework was in fact 70 percent rotted, but their request had been denied for safety reasons. Galvan Partners will present the new design to the full commission at its next regular meeting on September 14. It is not known if they will amend the design to address the concerns raised in the workshop or if they will present the design as it currently is. Sam Pratt has a troubling report on his blog this morning about the death in 1989 of a worker at TCI: "Death at TCI." Bruce Mitchinson, whose family owned 72 North Fifth Street just across the street from the "Armory houses," sent Gossips this picture he found in a family album. The picture, which was taken by Mitchinson's great aunt or great uncle, shows the residents of the three apartments at 67-71 North Fifth Street standing on their front porches. The woman at the far left is another of Mitchinson's great aunts. 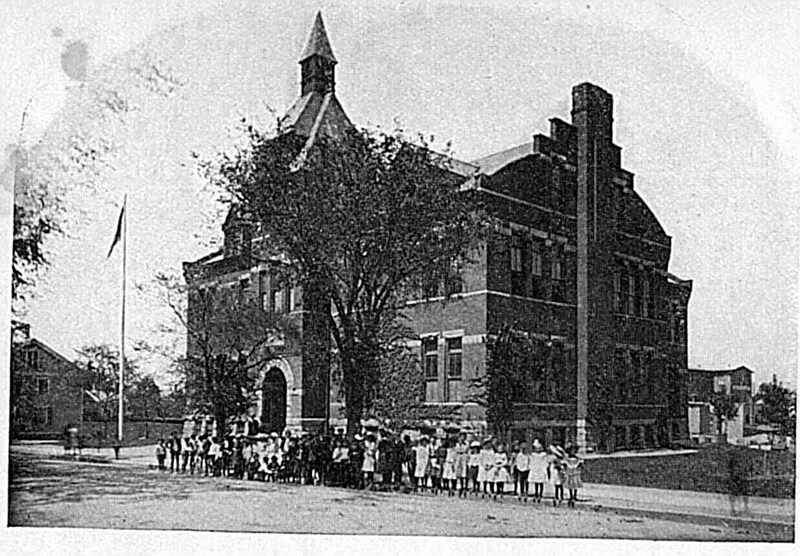 It is not known exactly when the picture was taken, possibly in the early to mid-1930s, but before the shrubs and awnings seen in this picture were added. A week ago, bail was set for Quintin Cross and his alleged accomplice, Jamont McClendon, but it wasn't until yesterday that Cross's bail was paid and he was released. While Cross is out on bail, McClendon remains in the county jail. Billy Shannon has the story in today's Register-Star: "Cross bailed out of county jail." The Trustees of the Hudson Area Library and the Galvan Initiatives Foundation have announced that Vincent Benic Architect has been chosen to design the new space for the library in the drill hall of the Armory. Tom Casey has the story in today's Register-Star: "Vincent Benic will design new Hudson Area Library." Yesterday, Ward Hamilton posted a comment on the post "Another Vision" that included a link to his blog, where he had published a rendering for a third design for 67-71 North Fifth Street--the one to be presented to the Historic Preservation Commission at their workshop meeting tomorrow morning. That rendering is reproduced here with Hamilton's permission. God is in the details, but this design is certainly closer to what the Historic Preservation Commission has been asking for, which raises the question of why it took three tries to get there. Certainly the Galvan people have been before the HPC often enough to know what will pass muster with the guardians of our architectural heritage and what will not. Contrary to the opinion of some, the decisions of the HPC are not arbitrary, unpredictable, or driven by personal agendas or personal taste. 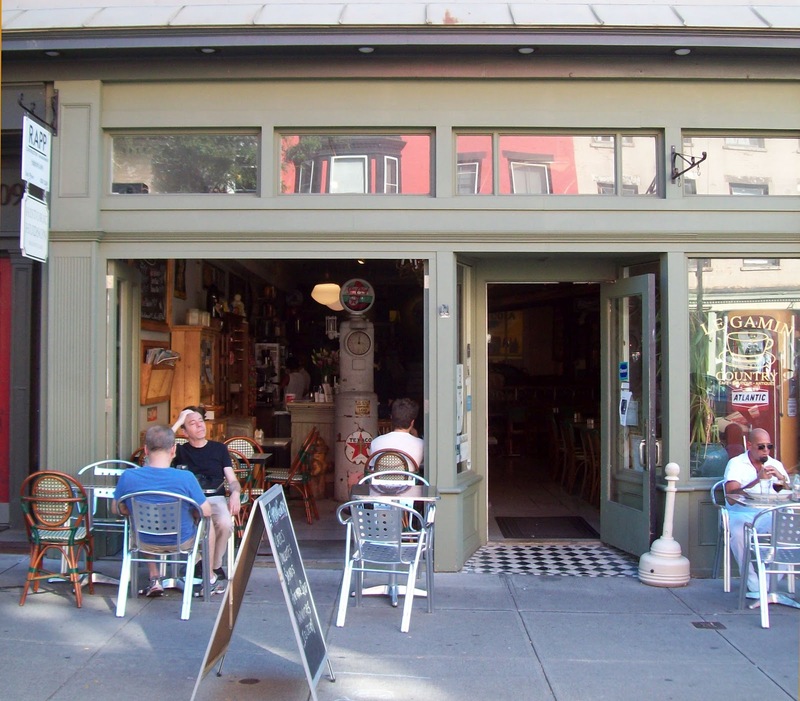 The HPC is charged with protecting Hudson's irreplaceable cultural resources and preserving the diverse and authentic character of Hudson's architecture, and the members of the HPC are carrying out the task they are charged with. Sometimes the Galvan people seem to be deliberately recalcitrant, creating opportunities for people who know little about historic preservation and care even less to rail against the HPC for standing in the way of progress and development. Hotel Yesterday, Hotel Tomorrow, But . . .
"Would You Eat a Salad Out of My Garden?" Can Scalera Serve Two Masters? "You got to know when to hold 'em . . ."